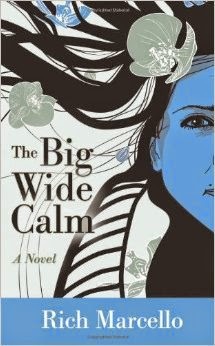 Today we are interviewing Rich Marcello, author of the coming-of-age novel The Big Wide Calm. Paige Plant is destined to be a rock star, to save the world, to inspire revolutions with her songs, and that is exactly what she sets out to do in The Big Wide Calm. Rich Marcello’s new novel follows Paige on her quest to create the perfect album–12 songs that will make her galactically famous and, during their creation, take her to places she never imagined possible. Paige has talent, ambition and mega-musical skills. All she needs is a big break. Enter John Bustin, a mysterious former singer/songwriter who offers Paige one year of free room and board at his recording studio so she can make her album. John believes in Paige’s potential but not her current batch of songs. Before writing new ones, Paige must tap into the place underneath emotion that is the source of all transcendent, multigenerational art; she must tap into The Big Wide Calm. With John’s help, Paige hones her songwriting skills, both technically and emotionally, and with Paige’s help, John confronts the dark secrets of his past, secrets which rock the foundation of their relationship. Anyone who likes a strong female character, who likes millennial coming-of-age stories, who likes music. This is the second of three books I’m writing about different kinds of love. The first, The Color of Home, came out in 2013, and the third, The Beauty of the Fall, will be out in 2015. So the main inspiration was to write down everything I believe about love. This book in particular was more about platonic love, though there’s a fair amount of romantic love in it as well. I’ve been writing in one form or the other all my life. I’ve published several hundred poems and songs, and for the last four years I’ve been working on my novels. The Unbearable Lightness of Being by Milan Kundera. Actually, I love all of his books, but that one in particular. I’ve found my voice as a writer, to the point where I’ve been able to effectively incorporate different elements—poetic language, poetry, lyrics, plot devices, realistic dialogue, first-person present tense narrators—into my stories. I’ve also honed my craft a bit. Sometimes I’ll write a scene fifty times until I get the words right, after writing the initial draft very fast. Rewriting a scene often seems to work best for me. I didn’t know that when I first started. I try to practice as many elements as I can when I’m writing. Character building. World building. Writing sensory scenes. Plot turns. Dialogue. Really, whatever is needed for the story I’m telling and whatever will push me as a writer. In The Big Wide Calm, I had a blast writing Paige, and I’m really happy with the way she turned out. Well, I’m also a technologist, so I liked English and science classes equally. I’m fine with it. It provides readers with a lower price point, which is good news. Also, with the new generation of e-readers, the quality of the reading experience is getting better and better. For the next year, I plan to finish The Beauty of the Fall. After that, I have a good ten or so novels in me. I plan to write for the rest of my life. A fan who read The Big Wide Calm told me it was one of the most emotional experiences she ever had reading a novel. She told me the book was a work of multi-generational art. That’s what I was going for as a writer, probably what we all go for as writers, so it was great to see my novel connected with someone in that way. No, I like the whole process. It’s what I was meant to do with my life. I haven’t had it. I think that’s because I have a lot I want to say, and I want to make sure by the time all is said and done years from now, that I’ve had a chance to say it all. I write on a computer using Storyist. I’m comfortable with technology, and Storyist is a great program. To finish The Beauty of the Fall. That’s all. Thanks for taking the time to speak with me.